One of my friends told me the other day that I might be obsessed with my cast iron skillet. [I’m looking at you Kiki Mojo.] And you know what, I think I am. If given the option of my cast iron or my regular fry fan, I’ll pick the cast iron every time. [Unless its dirty and I’m hungry, because let’s keep it real, I don’t want to wash dishes when I’m hungry.] 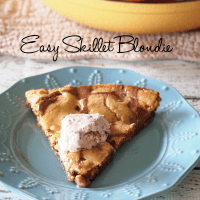 I could list the reasons I love it or I could just share delicious recipes like this easy skillet blondie. 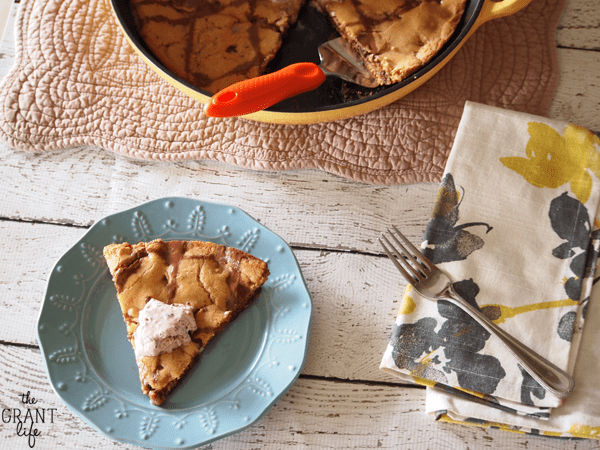 Because if you can make desserts in a cast iron skillet, then what more do you need?! The answer is nothing. 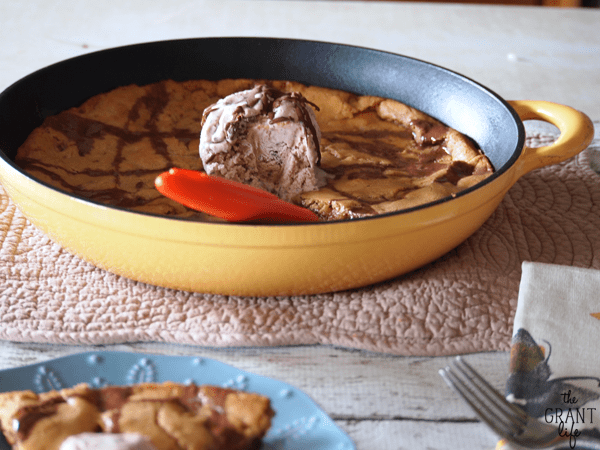 You don’t need anything more then a dessert baked in a skillet. A side of homemade ice cream maybe, but nothing besides that. Ok, maybe a little chocolate sauce on top of it all. But seriously. Nothing more then that! I have made blondies [and brownies] before, but this was the first time making them in my beloved skillet. I was slightly nervous when I put it in the oven for fear that it would stick to the bottom on the pan. 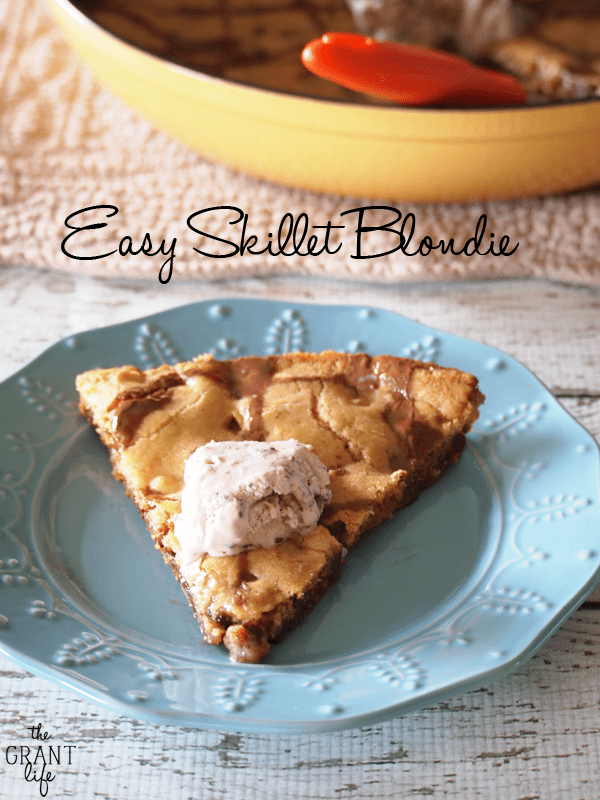 That would ruin a perfectly good blondie and skillet in one recipe. Drizzle a little chocolate sauce and add a scoop of ice cream and you are all set. 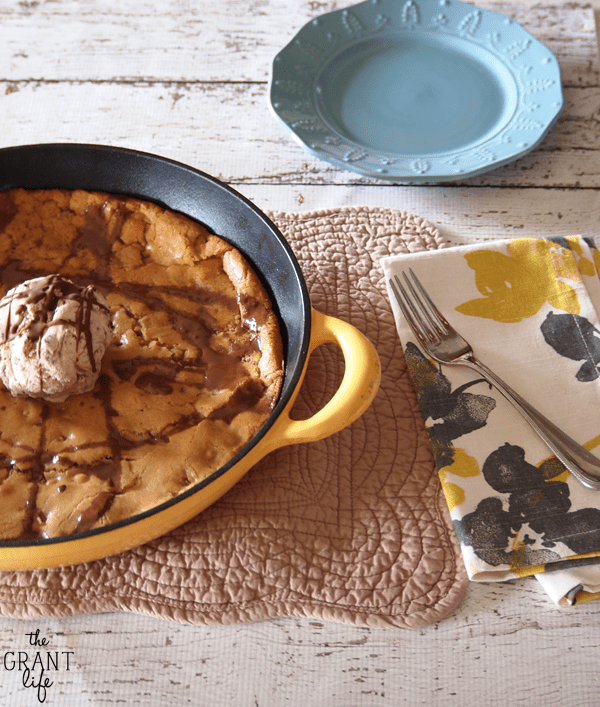 And then sit back relax and think of how much you love your cast iron skillet for making you such a delicious treat. Preheat the oven to 350 and put your in your skillet. Cream the butter, brown sugar, egg and vanilla together. Add in the flour, baking powder, baking soda and the salt. Blend together before adding the chocolate chips. Remove your skillet from the oven (careful! Its hot!) and add the 3 tablespoons of butter. Make sure it coats the bottom of the skillet. Pour the blondie mixture into the greased skillet. Bake for 25-30 minutes or until the edges are slightly browned and the center is fully cooked. This makes me want to buy a skillet just so I can make these. Hubby and I LOVE blondies! What a delicious use of a cast iron skillet! I’m definitely going to be making this soon! My husband will LOVE it! Wow! Yes, I’m wiping off my keyboard right now…that looks amazing! 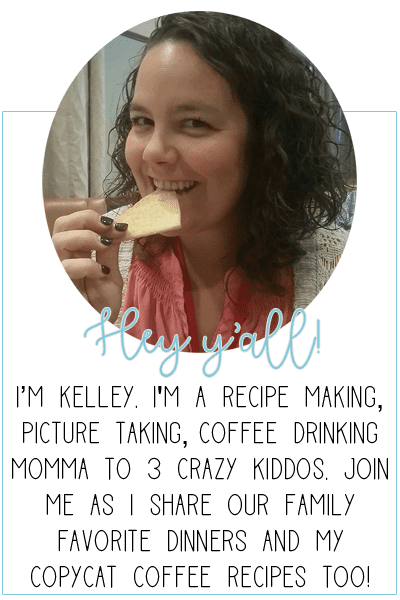 I’d love for you to link this up to my Creative Ways Link Party when you get a chance! Other people should get to see this masterpiece too 😉 Have a fabulous week!